In Windows XP it was fairly easy to add a link to the right-click menu in Explorer, so when clicked it would open the Command Prompt at that location. I posted a how-to in April 2008 on how to accomplish this. With the release of Windows Vista and Windows 7, the Tools >> Folder Options is no longer available, so the task required a new solution. Hold the Shift-key while right-clicking. This is built-in behavior. Open the Registry by entering "regedit" at the Run prompt. Navigate to the following key: HKEY_CLASSES_ROOT\Directory\shell. Create a new key called "Command Prompt." For the default value, add the right-click menu name, such as "Open Command Prompt Here." Navigate down to your new "Command Prompt" key (HKEY_CLASSES_ROOT\Directory\shell\CommandPrompt). Create another new key called "Command." For the default value, add this command: cmd.exe /s /k pushd "%V". 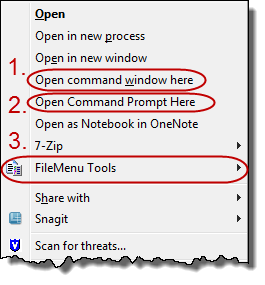 Use one of many 3rd party tools, such as FileMenu Tools. 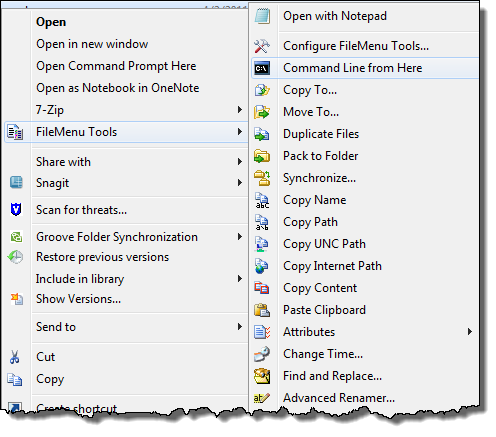 FileMenu Tools will add an additional menu item when you right-click, and that subsequent menu item will open a sub-menu with many new options including the Command Prompt.